Exploring what you really believe, Tim Challies and Josh Byers bring basic theology, presented in understandable text and colourful diagrams. They have a Periodic Table of the Books of the Bible, graphs, flow charts, Venn diagrams, and all-around great illustrations. As someone who doesn't read much non-fiction, I've always found the theology books rather intimidating, and occasionally wordy. Challies and Byers make theology more approachable, and for the visual learner, so much easier to tackle and remember. The illustrations and colour make every point stick that much more. For more information on Visual Theology by Tim Challies and Josh Byers, visit our website here. This is a wonderful little book about truth. And about lies. It's about identifying the lies that you have grown to believe, been led to believe, or let yourself believe, and it's about renouncing these lies for the truth of who you are in Christ. "As I pondered the word [my daughter] used - insufferior - I immediately realized I knew exactly how she felt [...] It is a combination of all of these fears - inferiority, insecurity, inadequacy, and insufficiency - adding up to low self-esteem." These feelings are rampant in society and around the world. They are an overwhelmingly common thing. We are constantly comparing our appearances, our words, our actions and our lives with everything and everyone around us. And it is destroying us from the inside. Melody Metzger holds a Masters in Therapeutic Counseling. Her book I Feel Insufferior introduces step-by-step help in overcoming the issue of insufferiority in your own life. She wants you to know that you are not alone, you are not helpless, and there is hope. She demonstrates how you can speak truth into the lies you're believing and she provides strategies for replacing the lies with truths. In this book, she sits across from you, counsels you, advises you, and guides you in the battle for your own mind. And what a battle it is. One of the things I especially liked about the format of this book was the way she organized the chapters, and placed the self-help/question sections at the end of each, rather than scattering them throughout the book like some authors do. Each chapter takes a different focus on issues with inferiority and inadequacy, followed by a section for self-help, strategies, and response exercises. It would be great for a group session or study dealing with issues of self-esteem, as well as for an individual exercise in self-healing. Her words are interspersed with excellent scripture and biblical truths to help you through the process - the beginning of healing. I am in no way saying the Metzger's book will erase insecurities from your life. She can only offer as much help as you are willing to accept, and there's only so much you can give anyone through the written word. I Feel Insufferior is most definitely a start, and a very good one. For more information on I Feel Insufferior by Melody Metzger, visit our website here. I think I read Rachelle Dekker's first novel a lot more critically than I usually would for any other author off the shelf. She's the daughter of my favourite Christian Fiction author. I expect great things from her. In The Choosing I did find that unique blend of spiritual and physical turmoil that Ted Dekker always captures me with, and some of the inner issues have similarities, but Rachelle's writing voice is still very distinct from her father's. Not to mention her setting and characters. She introduces a post-apocalyptic world that made me reminisce The Hunger Games and Divergent series, but with a different kind of a twist: a heavily patriarchal society, wherein a woman's worth is determined by the man that Chooses her in the Choosing ceremony that is held every year for those of age. Children go through lessons and classes all through childhood and into early adulthood, all with the purpose of being chosen. And those that are not fade into society as labour workers with little worth and no more than a fixed schedule of tasks to their name. Dekker follows Carrington, a young girl of decent social standing with all of the traits for being Chosen, but when it comes to the ceremony she's left behind, along with the rest of the worthless members of society. She can find no clear reason why she failed. The Choosing is about her transition into life as a Lint worker, cut off from her family and all that she grew up knowing, and her journey to discovering true worth. For more information on The Choosing by Rachelle Dekker, visit our website here. "I really enjoyed this one. Christopher Parkening shares his story of becoming a world renowned guitarist and waves in his love for flyfishing. Easy to read and quite inspiring. Plus, this edition comes with three free songs." Grace Like a River, with the free music included, is on at the House of James for only $2.99. 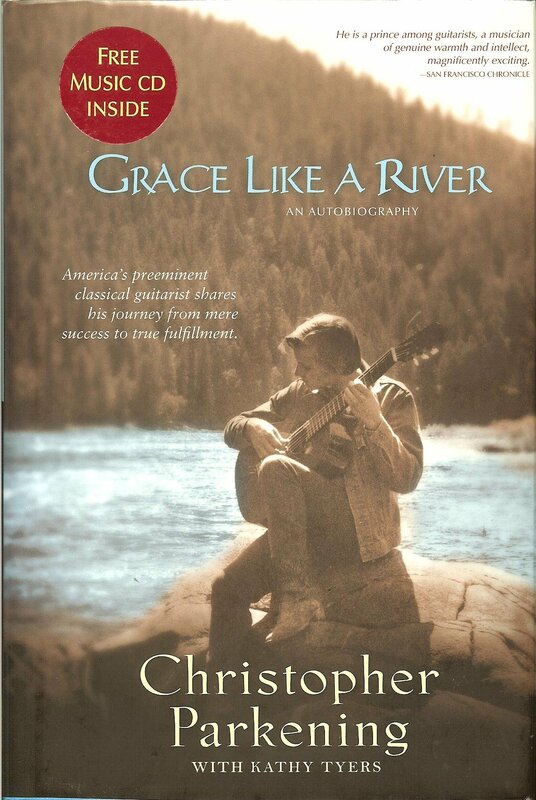 For more information on Grace Like a River by Christopher Prakening, visit our website here.